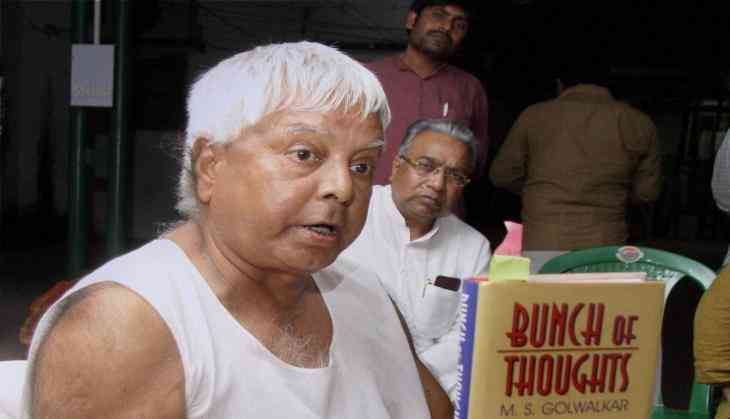 Rashtriya Janata Dal (RJD) supremo Lalu Prasad Yadav on Wednesday claimed that the reopening of Babri Masjid demolition case is clearly aimed at nixing the presidential bid of senior Bharatiya Janata Party (BJP) leader Lal Krishna Advani. After the Supreme Court on Wednesday restored the criminal conspiracy charges against Advani and other BJP leaders in Babri Masjid demolition, Lalu leveled a very serious allegation against Prime Minister Narendra Modi and Rashtriya Swayamsevak Sangh (RSS). He alleged that with the help of Central Bureau of Investigation (CBI), Modi and the RSS leadership have clipped the wings of Advani, whose name was in the running for the next President. 'The CBI, which is in the hands of Narendra Modi, told the Supreme Court that a criminal conspiracy case should be initiated against Advani and others, then, what should the Supreme Court do,' asked the RJD leader. He said that there were talks of Advani being made President of India, but now they (BJP, RSS) have cut the umbilical cord of Advani. Now, nobody would take Advani's name for the post of President,' said Lalu. The RJD leader said Modi is where today is because of Advani. 'It was only Lal Krishna Advani who had supported Narendra Modi after the Gujarat riots after then Prime Minister Atal Behari Vajpayee had said that 'Rajdharam was not followed' in Gujarat,' said Lalu. He termed the BJP, RSS and Vishwa Hindu Parishad (VHP) as very dangerous entities which even don't consider who is a family member or who is not. It is pertinent to mention here that a decade after the conspiracy charge was dropped by a lower court, the CBI had appealed to the Allahabad HC for its revival. The agency failed, following which it had moved the second appeal in the Supreme Court in February 2011.